As this month will mark the 244th anniversary of the Battle of Lexington and Concord (where my great-great-great-great-great-great-grandfather Jason Russell was killed by British troops), I decided to do a search to see how many patriot ancestors I had. I used the “Ancestor Search” on the website of the Daughters of the American Revolution. This does not necessarily identify all patriots, but rather those for whom a descendant has joined that organization, with caveats that not all service may qualify today. Using this search, I found 23 direct ancestors who served in the Revolutionary War. I also know of at least one more ancestor, Joseph Tourtellotte, who was not listed here, but had a wonderful pension record, bringing my total to 24. They were mostly privates, along with one corporal, two lieutenants, a captain, a major, and a surgeon’s mate. I also had another nine ancestors listed here under the category of patriotic service, for other ways they helped the revolutionary war effort. However, I was quite surprised after searching for my ancestor Daniel Ward (1700–1777) of Worcester, Massachusetts. I didn’t expect to see him here, given his age, but for completeness I checked every ancestor alive during the war. This report had the note that future applicants must prove correct service. I’ve seen this before, where in the past, a descendant of someone with a common name had claimed the service of someone else with the same name. However, the comments included the notation that he had “signed the petition of Worcester Loyalists, 1774”! This meant that descendants of my ancestor Daniel Ward had joined the DAR under the service of a different man of the same name, when in fact their ancestor was actually a Loyalist! Daniel Ward never left Worcester. He died three years after signing this petition in 1777. His probate apparently got held up until 1791, with his son Asa being accused of embezzlement. 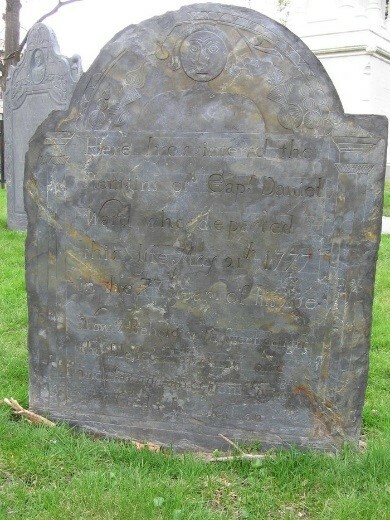 Daniel’s son and my ancestor Phineas Ward (1729–1808), along with the latter’s son Phineas, Jr., both served in the Revolutionary War for the colonies for several years, the younger Phineas serving under Daniel’s more well-known second cousin Major General Artemas Ward (1727–1800). One can only imagine the family discord between father and son during the remaining years of Daniel Ward’s life! Worcester County, Massachusetts Probate Records, Daniel Ward, 1791, Worcester, #61663. Massachusetts Soldiers and Sailors in the Revolutionary War, 16: 542-43. We need to talk. My brick wall great grandfather, Daniel D. Ward, was b. PEI 1804. My best guess for parents are Ebenezer Ward and Peggy Margaret Clark. Our Y DNA would suggest origins in New Jersey. I also have a DNA match to an Asa (B.?) Ward. Someone in our family has been looking for Daniel’s parents for over a hundred years. I had high hopes that DNA would solve the puzzle. So far it hasn’t been as much help as I expected. Very interesting find! In the South, folks run across a number of Loyalists in their lines depending on where they lived and/or ethnicity of the ancestry. Were certain parts of New England (like Worcester) hotbeds of Toryism? Chris as you know I am a descendent of a man who is considered a wild west, Captain George Meggison…Although I do not think he actually took arms against Americans I believe that he had supplied goods and build ships for the British troops. That is why he was granted land in Prince Edward Island. Fifty-two residents seems like a large segment of the population, was Worcester a hotbed of Toryism? In the Collections of the Worcester Society of Antiquity article I link, it says there were 250 voters, and that 52 appeared as Tories! The 52 were “confronted” to recant, of which 44 did so. Daniel Ward was one of the eight that refused! Chris, thank you for post about Jason Russell who is also my director ancestor. Our branch went to NH. When I was a DAR chapter treasurer, I found I had approximately 32 patriot ancestors due to several fathers and sons participating! I know you are also a Mayflower cousin of mine. Have you had a chance to look at the trailer I sent to Ryan and others regarding our Rose parade float in Pasadena on 1-1-2020? I’m glad you shared this story. I worked on a tree for my cousin and, for the most part, her ancestors who were alive during Revolutionary War served on patriot side. However, I was recently contacted by someone else working on her Worden line who wanted me to be sure to know that one Samuel Worden was a Loyalist – not a Patriot as other family trees claimed – and actively supported the British with food and supplies. I imagine in the Delaware, NY, and NJ areas that there were a lot of Loyalists. Are the sources at American Ancestors only available at their physical location? I’m not able to find the information on line so I can do the research you cited. The book on Massachusetts loyalists is in our library. I’m not aware of a version online. The other sources are available online through the links. So far, I have 12 Patriot ancestors and 12 Loyalist ancestors. The most interesting of these is my Loyalist ancestor Andrew Joslin who is the son of my DAR ancestor John Joslin. Early in my research, I found out that my dad’s paternal family, the Kasts and Helmers, were patriots who were named in the historical fiction ‘Drums Along the Mohawk’ about the Revolution in the Mohawk Valley, upstate New York. As I dug deeper I found stories of one of the sisters, Sarah Kast McGinnis,who became an influential Loyalist. Raised on the Mohawk Valley frontier among the Native Americans, she helped recruit them to fight for England as part of Sir William Johnson’s forces. Sarah had inherited the family business—then lost everything, including most of her family, after the war. She ended up in Ontario, where many of the Loyalists resettled. Would you tell me the common ancestor of “Daniel’s more well-known second cousin Major General Artemas Ward (1727–1800)”. This family descends from William? Yes, their common ancestor is Daniel Ward (ca. 1603-1687) of Marlborough, Massachusetts. He first appears in Sudbury, Massachusetts in 1639. My g…grandparents Julia Ann Paddleford and Stutley Weeks Treadway were married about 1834. They were the grandchildren of a Treadway and a Loyst who fought on opposite sides of the revolution. The Loyst brothers moved to Canada in 1783. Probably had to flee as they foughtThey accepted free land as United Empire Loyalists. Some of their descendents lived near the New York state border which is where some Treadways located after the war. My Treadway soldier was paid a bounty to serve in someone else’s place.